Haruya goes to an art college while working as a popular gay prostitute. He doesn't realize it, but he's in love with his best friend since junior high and classmate Kazushi! However, his shameful feelings must remain a secret. Haruya continues to work while in denial about his feelings, until one day, he witnesses Kazushi doing something unbelievable!! After much consideration, Haruya takes action...... Admire the pure (!?) love and the confident eroticism between an emotionless art student and a gay prostitute. This is Owal's first full-length manga. A love-filled, previously-unpublished chapter is included!! NOTE: "The Trials of Snow White", which is included in this manga, has also been published separately as a stand-alone story. 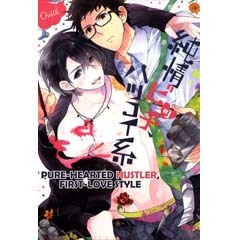 Pure-Hearted Hustler, First-Love Style - Renta!